As I've been slowly making my way through our stuff and deciding what to keep and pack, what to try to sell, and what to just throw away, I encountered the neglected electric waffle/panini maker in the depths of a kitchen cabinet. I can't even remember the last time I used it. I do remember that we got it for free, via a buyer's incentive scheme sort of like frequent flyer miles, run by one of our local supermarket chains (it's Coop Supercard, for people living in Switzerland). I think I've used it about 5, 6 times tops, all but one of those times to make panini. I'm just not a waffle person I guess. So, as I pondered whether I was going to get rid of the waffle maker at the garage sale coming up next week or just dump it, an idea popped into my head. Why not try to make moffles with it? Moffles　(pronounced moffuru) are a Japanese invention, which have been popular for a couple of years. 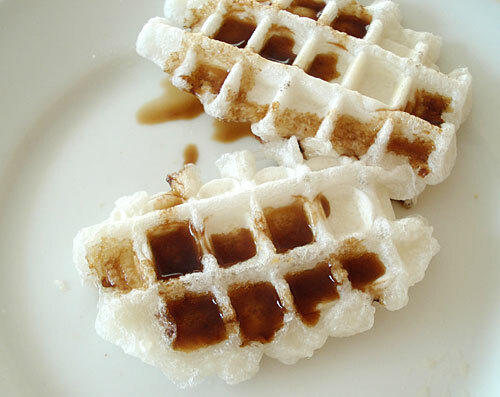 They are basically mochi cakes cooked in a waffle-maker like contraption called, of course, a moffle maker. Apparently the moffle was the brainchild of an employee of an electric appliance maker who was giving an instore demo of a regular waffle maker. She overheard a customer saying "If you could use that thing for cooking mochi, it might actually be useful" or words to that effect. 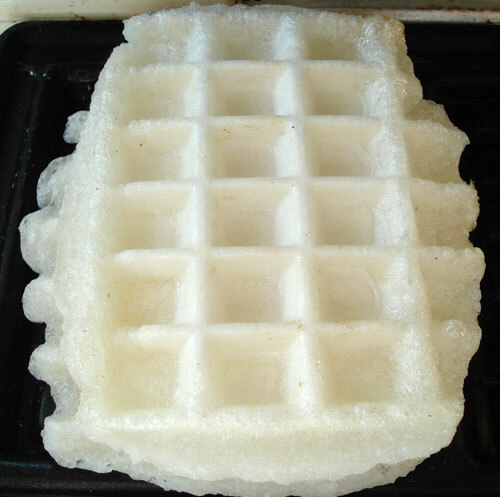 Back at the office, she tried cooking mochi in the waffle iron and found it surprisingly easy. Thus, the moffle was born. 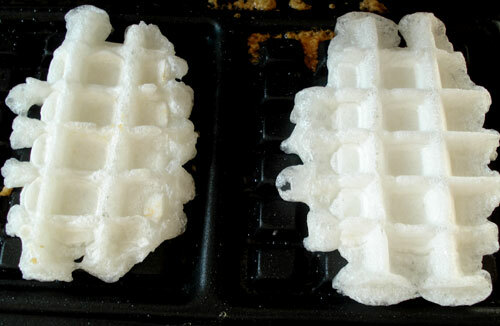 So, here is how I went about making moffles in a regular electric waffle maker. 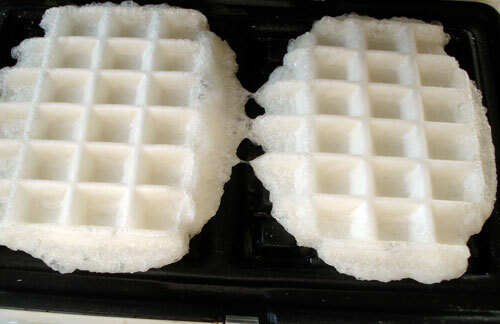 (A moffle maker has shallower, round dimples rather than the deep square ones in a waffle maker.) Incidentally, my waffle maker is from Tefal. It's a clamshell type, has a simple dial-timer, detachable plates for making waffles or panini, and annoyingly switches on as soon as it's plugged in. 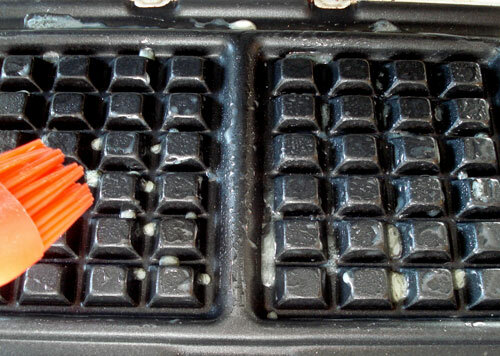 First, brush the surface of the waffle iron plates with a little melted butter or oil as they heat up. 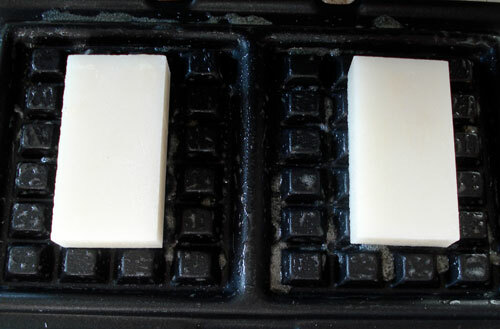 The mochi can stick a bit (especially on the square edges of the waffle plate) and this is to prevent that as well as to add a bit of flavor. Place one square mochi cake on each plate. Now lower the lid and press gently. 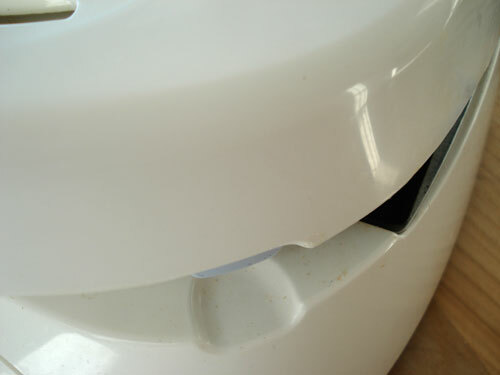 The lid will not close, due to the thickness of the mochi, but as you keep pressing gently the mochi will soften and spread, becoming thinner, until you can close the lid completely. As soon as you can, set the timer to 2 minutes or so, more if you want it really crispy and a bit toasted on the outside. And when the time's up: Voilà, moffles! Moffles are often filled with something savory or sweet. Here I've kept it simple and put some sliced cheese on one of the moffles. Here's a plate of grilled cheese moffle, cut into quarters. The yellowness of the cheese can be seen through the translucent white moffle. To make thinner, smaller and crispier moffles, you can slice a mochi cake horizontally in half (you can do this easily with a just-opened fresh mochi cake, using a sharp knife. In Japan, thinly sliced mochi called shabu-shabu mochi are often used). Once you can close the lid, which should be just about immediately, set the timer to 2 minutes. You can eat the moffles singly with just a little soy sauce instead of filling them. I like them best like this I think. They should go well with anything that goes with regular grilled mochi cakes, like kinako (toasted ground soybean powder) mixed with sugar, or grated daikon radish and soy sauce. You can also treat them as you would regular waffles, and put on syrup, melted butter, chocolate sauce, etc. as you prefer. 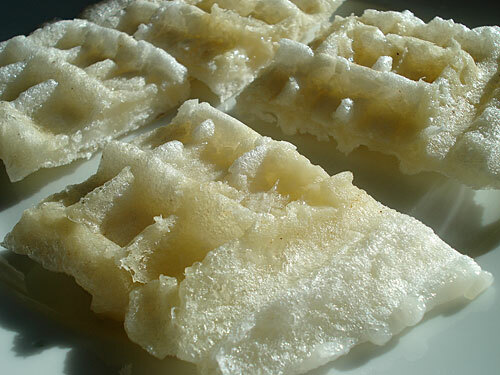 However, they are not like flour-and-egg waffles - they are like thin mochi cakes, crispy-chewy on the outside, gooey on the inside, and bland. If you like mochi, you'll love moffles. And of course they are gluten-free, since they're made of pounded rice. They are not low in calories, but they are very filling. One cheese filled moffle using 2 mochi cakes and 30g of cheese is about 400 calories, but half of one is plenty for a snack. They must be eaten freshly cooked and hot, since they turn hard when cool. 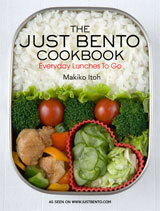 They are not suitable for bentos. The best thing is that they cook up so fast, and are very filling - great for snacks. I think I will keep the waffle maker after all. Submitted by maki on 2009-02-15 15:59. Grilled cheese photo, I do not see it. Is it possible you may have forgotten to post it? Indeed I did. Added now. It's been a little while since I've been to your site, and I was so excited to see the PDF option for downloading individual blogs/recipes! I had been copying the recipes I liked to Microsoft Word (which was a pain, and looked a bit disorganized) because I wanted to avoid printing them all out. Now I can't wait to get PDF copies of my favorites! I tried to use this option though, to no avail. Technical difficulties on the site, or on my computer? Take care, and good luck in the move! Oops, that was me - I forgot to install something when I upgraded that part. It should work now! Hmmm... I don't have a waffle maker, but I do have a George Foreman grill. Oh man, I see a moffle addiction. Can you use fresh motchi (like the ready soft squidgy stuff) rather than the hard blocks? Its realy difficult and expensive to find the hard blocks where I am but I make the soft stuff myself and want to try this. It was my understanding that what made rice sticky was the gluten that was in the rice. If rice is gluten free, then what makes it sticky? Rice does not contain gluten, which is a component of wheat and a few other grains (notably barley). Short-grain rice or mochi rice (there are other names for it) is called 'glutinous' because it is sticky and glue-like, and when pounded forms mochi, which is very gooey and sticky. It's sticky because it contains only a small amount of amylose and a high amount of amylopectin (both are types of starch) while non-sticky firmer rices contain more amylose and less amylopectin. In any case, rice of all kinds, unless they are 'enriched' or flavored, are gluten-free and safe for people with gluten intolerance problems to eat. I also got a free waffle maker that I hardly use, because most of the time I'd rather eat salty foods than sweet, syrupy stuff. I can't wait to try moffles with soy sauce. I just had toasted mochi with packaged red bean soup last night..it was wayyy too sweet. Wow sounds delish! :D Now I need to buy a waffle maker hehe. MmMmMm! I love my moffles in the morning, I work the night shift in a hospital but haven't adjusted my meal schedule so I like waking up in the afternoon and having a grilled cheese moffle style for lunch...thanks for the recipe and inspiration! I've finally gotten around to trying this, and what-do-you-know!—it's great fun! It's the sort of thing that makes me slap my head and say "Why didn't I think of this!" Thanks so much for this post (actually thanks for your whole blog!)! I couldn't figure out what the heck the attraction of these things were supposed to be, or how to fix them. (the package of course was all in japanese and everything I found on the net said basically toast them in a toaster oven, which I do not have, or grill them, which I also do not have) I tried baking one, and pan frying one, and it was just sort of like eating soft plastic. I don't have waffle maker either (I live in a VERY tiny place, only three rooms and the kitchen has no prep space, you have to put a board over the sink and use that) what other things can you do with these to make them tasty? They were inexpensive and are probably filling if prepared right, so I'd really like to try them again. Hello, I bought some home-made mochi in and asian super-market, and I would like to know if I should put it in the fridge or freeze it, and how long will they be fine in there? The main problem with keeping fresh mochi is dehydration. You can keep it for a limited time in the freezer, very well wrapped, but you really should try to use it up ASAP. Don't refrigerate it, it will just dry out and/or become moldy. Moffles? Cheese? At first I thought this was too bizarre to be mochi, but it's worth a try since I do have that waffle maker I got for a wedding present a million years ago. Never tried that rectangular mochi since I've been lucky enough to have an aunt who gets together with friends to make it fresh every year. And years ago I studied at a taiko dojo that had a mochi-pounding get-together every year where it was made in the traditional way with big wooden mallets. A little butter or oil on the waffle/moffle maker helps make that burnt part, as does the melted cheese. And in my family, we always freeze our mochi. In fact, I think I still have one piece leftover in my freezer from last New Year's batch. Of course, this was plump, home-made mochi, not the flat rectangular kind. All this mochi talk has got me hungry! Sugar and shoyu are my dipping sauce of choice and childhood. Yesterday I got together with a friend who has a table-top mochi maker and made 10 lbs of mochi. The machine cooks and pounds the rice in under a hour. Now if only it would wash the rice and pop out the mochi it would be perfect! We were both so curious that the first thing we did when all the mochi was laid out was make moffles. They were great: crispy and chewy. The butter that we had used on the waffle maker gave a wonderful flavor, but the leftover butter burnt the second batch. We ate them with a sugar/shoyu and a kinako/sugar dip. The latter adheres better if you first dip the mochi in water or shoyu. Sorry that we didn't take pictures of the Mickey Mouse waffle maker. While it was cute (loved eating the ears), we had a little trouble with the mochi oozing out the sides. 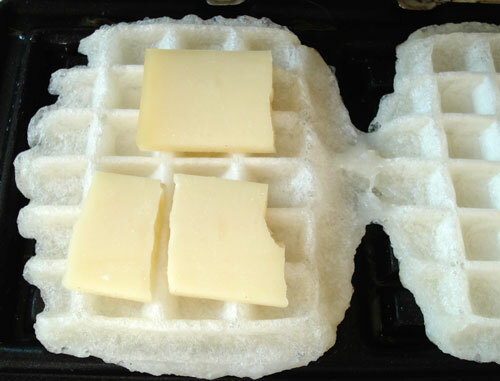 The next time we will use a traditional waffle maker and smaller mochi. The mochi maker had two settings: regular and soft. Except for the fact that the regulars dried faster as we made them and got wrinkly, we could not discern any difference in the mochi. Any insights? If I had the space, I'd get a mochi maker! The soft setting is probably for mochi that is meant to be eaten as soon as it's made, for oshiruko, ozouni and so on. One of my favorite ways to eat fresh mochi is to sprinkle it with tons of kinako, brown sugar and a drizzle of soy sauce. Another way I like it is with lots of grated daikon radish and soy sauce. Also, it's great with natto! You can try dropping little balls of it in miso soup. The regular setting is probably for mochi that is meant to be rolled out into a sheet, dried and cut up. I live in Washington state an visit Portland, Oregon a lot. We used to have a Dragon Toast booth at the Saturday Market where they had a specially designed Moffle maker which could cook five or six at a time. They served them with everything! !...peanut butter and jam, pizza toppings, cinnamon and sugar, all sorts of things. It varied and I loved them all! Those who are gluten free will LOVE LOVE the crispy crust! I warm my toppings with my sauce while the waffle cooks, top with pizza topping and cheese and broil for two or three minutes! HEAVEN.. Experiment like you would with sandwiches and make tuna, ham and cheese, or broccoli and cheese...ideas are endless!! I am very curious about the Moffle set-up of Dragon Toast. Was it a mix or batter? Did they sell a mix that you could take home? I have a brochure or menu of the Magic Mochi Crystals but never had a chance to try. Anyway to contact the booth owners? or get my hands on the product. Much is appreciated.